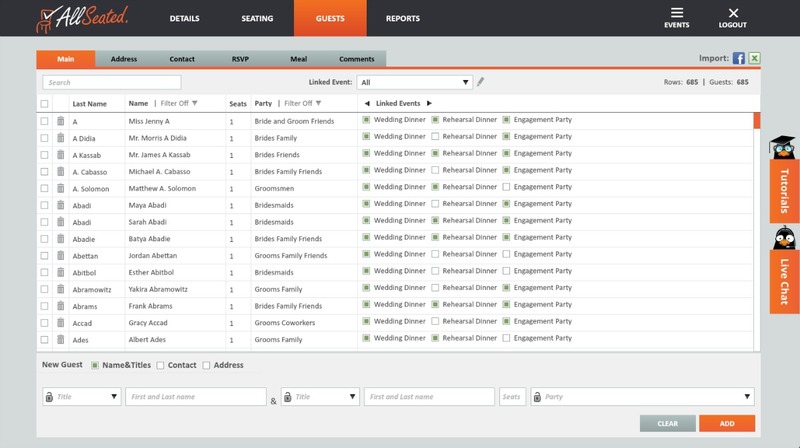 AllSeated is YOUR event management system, updated in real time and available at your fingertips! Organize, manage and collaborate on all planning aspects of your event including guest list, floorplans, seating arrangements, timelines and more! As your event management system, AllSeated gives you access to state-of-the-art collaborative tools for all of your events. Build and manage your event guest list in your AllSeated account. Enter guest names and mailing addresses which you can store alphabetically or choose to filter into specific categories for even easier organization. Your guest list has spaces for you to keep notes, enter meal type information and track RSVP’s too! Have fun building and arranging your floorplans! Our floorplan and seating tools make it easy to place and move tables as you design your layout. We have dozens of table styles available in the AllSeated furniture library. You can choose from a wide variety of table shapes and sizes customize the spacing between tables, number of chairs around each table, table numbers, and table assignments. In addition to selecting tables and furniture for your floorplan, you will also be able to make space for the dance floor, band, and other features in your layout such as placement of the bars, buffet tables, and exit locations. All floorplan details can be modified and changed with just a few clicks of your mouse at any time in your event planning process! As you design your floorplan layout, you can switch views from 2D to 3D to take a tour of your floorplan. AllSeated’s 3D tool allows you to create a virtual walk through of your event, bringing your event and its floorplan to life! 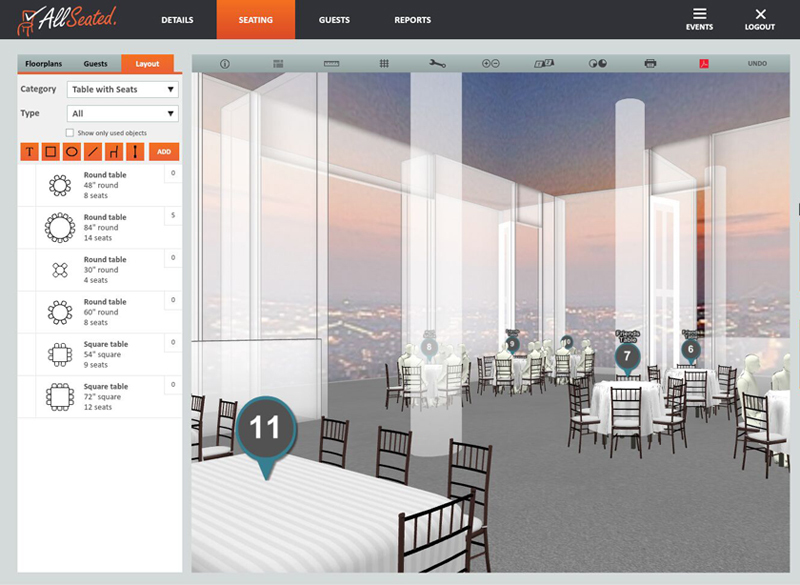 Easily seat your guests directly from your guest list at the tables you have positioned in your floorplan layout. While in the seating tab, click on the guests tab to the left, to have access to your guest list. Simply select a guest, and then click the table in your floorplan at which you want the guest to sit. AllSeated also offers the option to seat your guests at specific seats, by first placing them at a table, clicking that table, and assigning them to their specific seat. Generate useful reports that can be filtered to meet your needs. 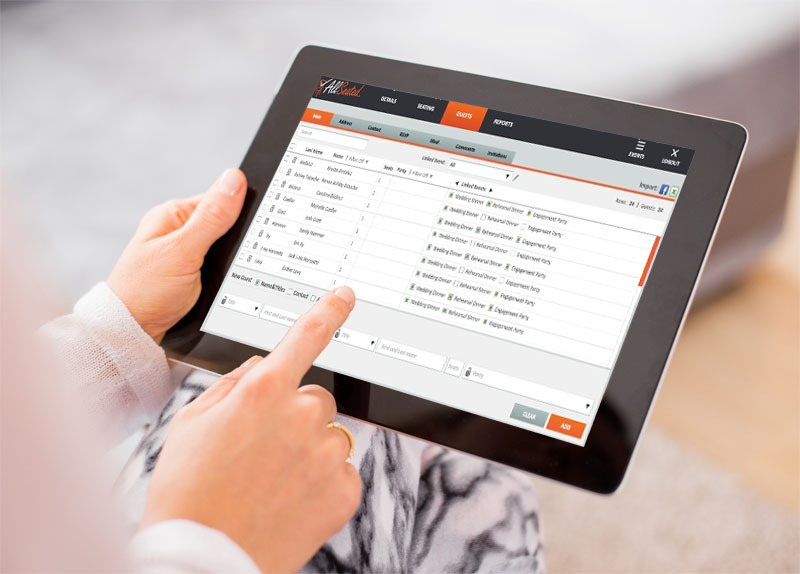 Create reports from both your guest list and floorplan which can be provided to your vendors for many useful reasons. Your floor plan report will dictate your desired layout along with your seating so that the room is set up the way you desire. Your guest list report can be given to the calligrapher for invitations, place cards and even for personalized favors. AllSeated provides you the easiest and most effective way to collaborate with your vendors and entourage throughout your event planning process. Invite your close friends and/or family members into your account for help with tasks such as entering guest information, designing the floorplan layout and assisting with arranging your seating chart. You can also invite your vendors into your account in order to collaborate in real-time regarding floorplan layout and event timeline. AllSeated offers you the ability to create multiple timelines for your event. In addition to creating a day of timeline for yourself to keep track of beauty appointments and your schedule of events leading up to the affair time, you can also create a vendor timeline. Vendor collaboration within a vendor timeline will keep everyone working your event updated in real time and on the same page for your event. The collaborative nature of AllSeated provides a true event management system for everyone involved. The vendor timeline will allow for vendors to understand the flow of set up, event details and the timing of break down at the end of the night. AllSeated’s Day-Of Mobile App for tablets allows you access to your event on the go with a full check-in system including real-time collaboration, live check-in updates, overview of check-in status and ability to view your floorplans in both 2D and 3D. The day-of Mobile App also allows you to let your guests know where they are sitting via check-in. Simply enter a guest’s name and their seating information will pop up.